The red-wattled lapwing (Vanellus indicus) belongs to the family of plovers, dotterels and lapwings, Charadriidae. The red-wattled lapwing species are distributed in the Indian subcontinent, southeast Asia, southwest and southcentral Asia and China. This lapwing species has a small, reddish fleshy wattle in front of each eye. These lapwings are polytypic species. The red-wattled lapwing (Vanellus indicus) is a large lapwing, measuring 30 to 35 cm in length and weighing 110 to 230 grams. The wingspan is 80 to 85 cms. The upperparts and wings are pale brown with purple sheen. The head, neck, chin, throat, breast and upper belly are black. A prominent white patch runs from the sides of the crown to the flanks along the sides of the neck. The lower belly, vent region and the undertail of the red-wattled lapwing are white. The rump is white. The short black tail is tipped white. In flight, prominent white wing bars are seen. The red-wattled lapwing bill is reddish with black tip. The irises are reddish brown. There is reddish eye-ring connected to the small, reddish, fleshy wattle. The long feet are yellow. The red-wattled lapwing male and female are similar in plumage. Their call is a loud, raucous, creaking and strident "did he do it" or "pity to do it" sound. These red-wattled lapwing species are distributed in Indian subcontinent, southeast Asia, southwest and southcentral Asia and China. In the Indian subcontinent, these lapwing species are distributed all over India, Pakistan, Nepal, Bhutan, Bangladesh and Sri Lanka. In southeast Asia, these species are distributed in Myanmar, Thailand, Cambodia, Laos, Vietnam, Malaysia, Singapore and Indonesia. 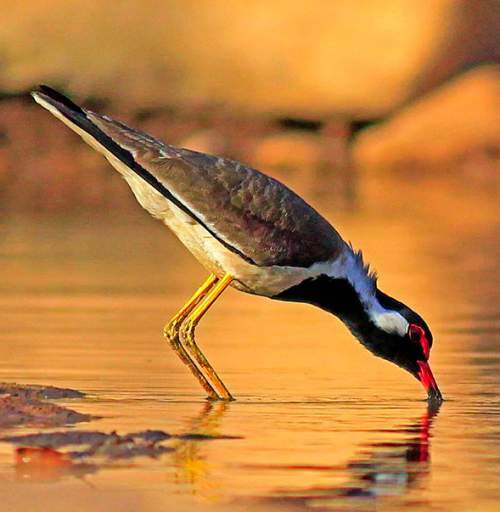 In southwest and southcentral Asia, these red-wattled lapwing species are distributed in Israel, Saudi Arabia, Kuwait, Qatar, Oman, United Arab Emirates, Syria, Iraq, Iran, Turkey, Turkmenistan and Afghanistan. Vagrant birds have been observed in Bahrain and Jordan. The Important Bird and Biodiversity Areas (IBA) of these red-wattled lapwing species in Turkey are Cizre and Silopi. These red-wattled lapwing species do not normally occur in forest. These species normally occur in altitudes from 0 to 1800 meters. The artificial ecosystems and habitats of these lapwing species include cultivated lands, corn fields, grass fields, pasturelands, fallow agricultural fields, ploughed lands and rural gardens. 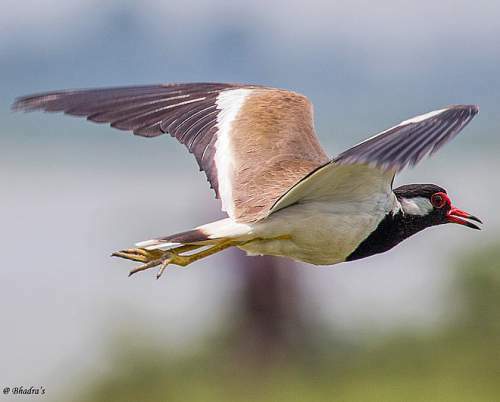 The natural ecosystems and habitats of these red-wattled lapwing species include open forests, wetlands, flooded grasslands, riverine gravel islands, montane plains and ravines, freshwater marshes, rivers and streams. The diet of red-wattled lapwing consists mainly of insects. Beetles, ants, termites, grasshoppers, crickets, butterflies, insect imagoes, insect larvae, small gastropods, crustaceans and worms are their primary food. The red-wattled lapwings also feed on seeds, grains and other plant matter. They forage mostly on the ground. They also scratch the ground with their long, strong legs to bring out the prey hiding in the soil. The breeding season of these red-wattled lapwing species is from April to June in Iraq. In the Arabian Peninsula, the breeding season is from January to July, with a peak in April and May. In India, the laying season is from March to September. These red-wattled lapwings are monogamous and highly territorial. The male courtship display include standing erect with stretched neck and tumbling flights. The female responds by short, quickly repeated calls. The red-wattled lapwings prefer nesting sites close to water. The nest is a shallow scrape, which may be bare or lined with small stones. Both of the pair take part in nest building, incubation and care of chicks. The female lapwing lays eggs on alternate days and the typical clutch contains four eggs. The eggs are pyriform (pear-shaped), colored pale olive green or buff with blackish brown spots and markings. The chicks hatch out in about 25 days and the hatchlings are nidifugous. They leaving the nest shortly after hatching. The red-wattled lapwing hatchlings have grayish brown down feathers with black mottling. These red-wattled lapwing species are mostly non-migratory, resident birds. Birds in higher elevations may move to lower levels and plains in winter. Small populations of the red-wattled lapwing in eastern Iran, southern Turkmenistan, western Afghanistan, northwestern Pakistan and northwestern India are migratory, moving southwards for wintering. Post breeding, the resident juvenile lapwings may disperse and establish in new locations within the range. They may make local movements for feeding and breeding within their range. There is also dispersal during rainy season. The global population size of the red-wattled lapwing (Vanellus indicus) is estimated to number about 50,000 to 60,000 individual birds. The overall population trend of these species is unknown. Throughout its range, this lapwing species is reported to be uncommon to common. The generation length is 9 years. Its distribution size is about 15,100,000 sq.km. Habitat alteration and destruction, hunting and capture for pet-trade are the main threats that may endanger the survival of these lapwing species. The red-wattled lapwing (Vanellus indicus) does not approach the thresholds for being Vulnerable either under the range size criterion, or under the population trend criterion or under the population size criterion. The IUCN (International Union for Conservation of Nature) has categorized and evaluated the lapwing species and has listed it as of "Least Concern". 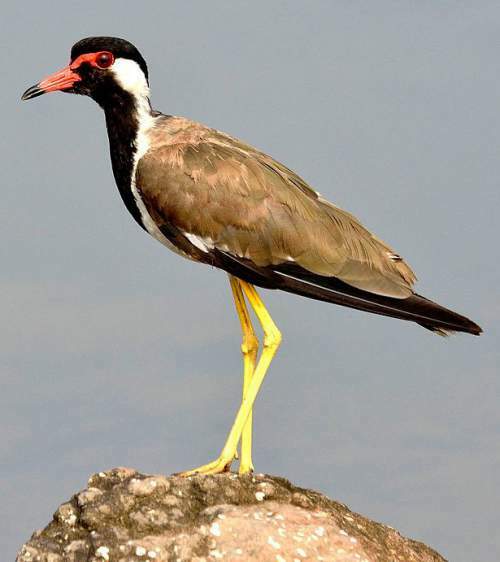 The CITES (Convention on International Trade in Endangered Species of Wild Fauna and Flora) status is ‘Not Evaluated’ for red-wattled lapwing (Vanellus indicus). The red-wattled lapwing (Vanellus indicus) are placed under genus Hoplopterus or Lobivanellus by some authors. The four recognized lapwing subspecies are: V. i. indicus, V. i. aigneri, V. i. lankae and V. i. atronuchalis. Current topic in Birds of India: Red-wattled lapwing - Vanellus indicus.